The Westboro Community Association was out in force at the launch of the Urban Forest Management Plan on September 23rd. Concerned residents had joined the WCA to raise awareness about the rising numbers of Westboro’s big trees being cut down to make way for infill development. Each of the four Westboro placards gave an example of how City Forestry’s lack of action on enforcing tree protection bylaws has led to the loss of many healthy big trees. Westboro’s efforts drew attention thanks to the energetic support of two Nepean High School students. Their storyboard placards telling the sad tale of how the dramatic loss of tree canopy has impacted their neighbourhood. 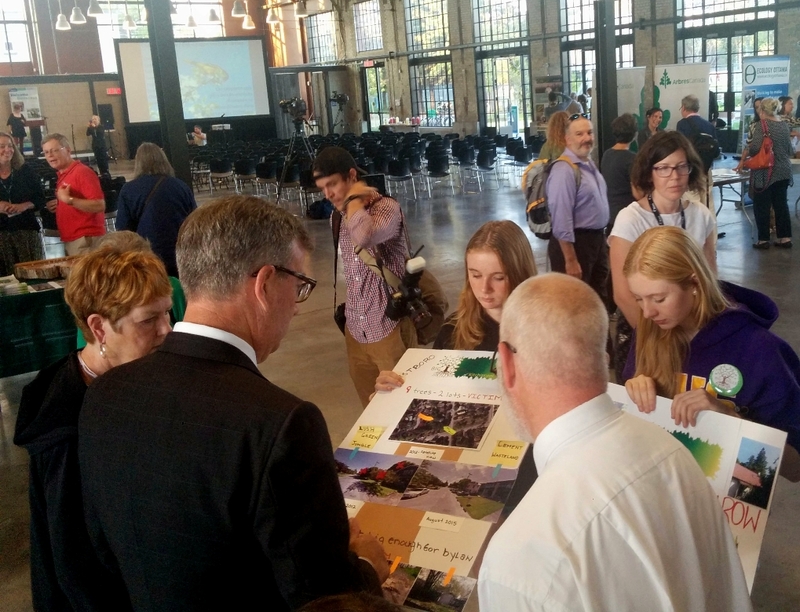 Their activism caught the eye of Mayor Jim Watson and the Councillor Jeff Leiper. 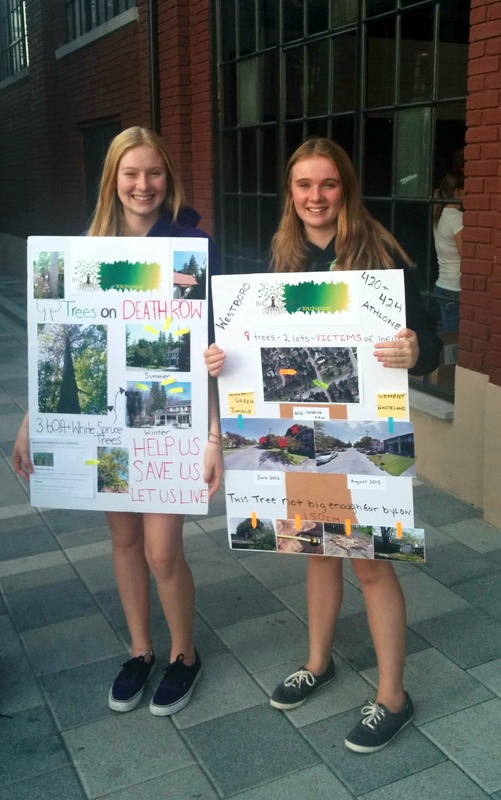 Hayley and Molly Goodman, both Nepean High Schoolo students, holding their placard examples Westboro’s loss of large, mature trees. Westboro tree advocates describing the impact of the loss of neighbourhood trees to Mayor Watson and Councillor Jeff Leiper. The students, the residents and the WCA members all agreed that the Mayor is not aware of the Westboro big trees clear cuts. The Mayor is fixed on his initiative to plant one million saplings by 2017. He does not realize that it will take over 25 years for these baby trees to have the beneficial impact on air quality that Westboro’s mature trees. If you care about your neighbourhood’s environment and want to save our big trees, take action to help the Mayor understand big trees need to have the bylaws protecting them enforced. This intervention was organized by the BIG TREES of Kitchissippi, a grassroots organization of community associations and groups that have come together to save our ward’s diminishing tree canopy. 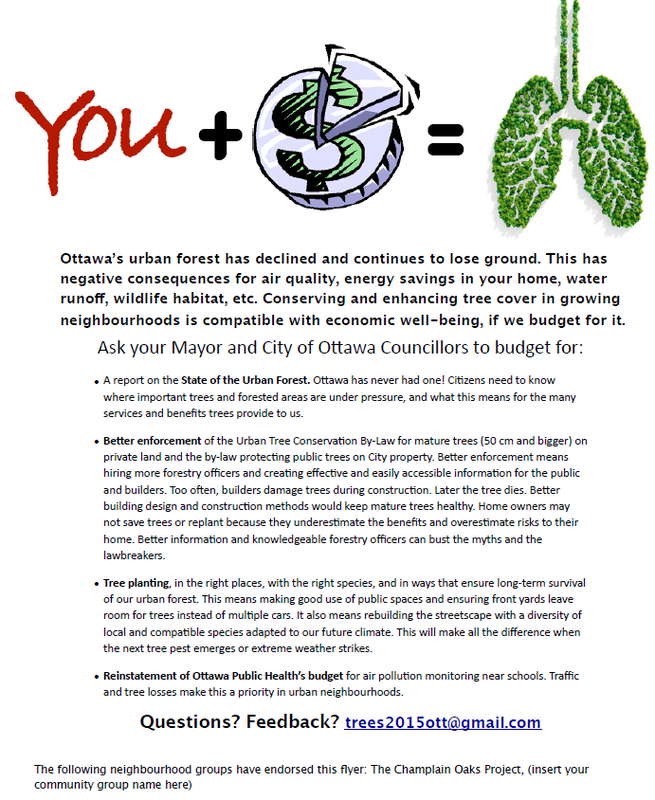 Email Mayor Watson and let him know that you would like City Forestry to protect Kitchissippi’s big, mature trees. Report any tree loss in YOUR neighborhood to the the BigTreeWestboro Rep at bigtreeswestboro@gmail.com of the Westboro Community Association. Volunteer with the Big Tree Westboro group or as a Westboro Community Association Board Member. Together we can stop the destruction of our tree canopy. Help us save our big trees to ensure our neighbourhoods stay healthy and beautiful. AGM of the Westboro Community Association on 22nd of Oct, 2015, 7pm at the Churchill’s Senior Centre. A presentation of the Big Trees of Kitchissippi group will be featured. Mature, healthy trees support the quality of life in Westboro. Trees with large canopies clean the air from traffic and heavy machinery emissions. They help to reduce stormwater runoff. Along with carbon sequestration, this is crucial in meeting the climate change challenges forced upon urban environments in the 21st century. Large trees in established neighbourhoods and parks do more than work for us. They also beautify properties and streetscapes. They provide birds and other creatures with homes. They cool our homes in summer. The emerald ash borer (EAB) has infested thousands of Ottawa’s mature ash trees. In Clare Gardens Park alone, 22 mature trees had to be destroyed in 2014. Forestry Services of the City of Ottawa estimates 75,000 ash trees will die due to the EAB—and that represents only those on municipal lands. No one is clear how many mature ash trees on private land will also be removed, at the owners’ cost. In recent years, urban infill housing and construction of large footprint “monster” homes have been squeezing out, damaging, and often destroying Westboro’s mature, healthy trees. What replaces them? Bushes and shrubbery, because a building’s footprint and lack of back or front yards means there’s no room to plant a maple, oak, walnut or other large species. What do you need to know about tree protection in Westboro? What can you do when you believe a healthy tree is threatened? We have created this primer to inform you. Ottawa’s Urban Tree Conservation By-law, passed in 2009, makes it an offence to destroy or injure “distinctive” trees on private property. As defined in the by-law, “distinctive tree” means any tree with a Diameter at Breast Height (DBH) of 50 centimetres or greater. The City, through the Forestry Services Branch, implements the by-law through a permit system. A permit allows a property owner (on land less than 1 hectare) to destroy a distinctive tree. The by-law applies to trees (of any species) that are 50 cm or more in diameter at breast height (1.3 metres or 4 feet from the ground). When a property owner applies for a permit to destroy a tree, the City mandates that the application note whether the tree in question straddles a property line. If it does, both parties must agree to the tree’s removal. How is this enforced? It’s not clear how Forestry Services mediates disputes between property owners over “boundary” trees. A recent case in Toronto used civil litigation to settle the matter. An amendment to the by-law (Amendment by law 2013-102) came into effect in 2013. It states that all site plan applications, committee of Adjustment applications, and building permit applications within the urban core must include a Tree Disclosure Information Report. Community associations in Kitchissippi have noted that such reports were not on file with Committee of Adjustment, even in April 2014. The Disclosure Report is supposed to list all city-owned trees on a property next to the site, all distinctive trees on the site, and any distinctive tree on an adjacent property with a root zone extending to the site property. For those who care about tree protection, the City’s inability to ensure that Disclosure Reports exist raises questions about enforcement of the by-law. Because Ottawa’s by-law explicitly refers to both destruction and injury (or damage) to distinctive trees, you might wonder what system exists to protect distinctive trees from damage. This information sheet (Upholding injury provisons) provides a perspective on this question. Call 3-1-1 to report contraventions of the by-law. The Municipal Trees and Natural Areas Protection By-law (2006) protects trees of any size and any species that grow on municipal lands. The by-law requires builders to get approval from the City of Ottawa to do work that might have an impact on any tree on public property (street or boulevards, and parks). The work usually involves excavation within the critical root zone of a tree on public land, whether the work itself happens on municipal property or private property. The by-law also sets out the conditions for work, such as erecting a fence at the perimeter of the tree’s drip line and keeping heavy machinery off the critical root zone. This information sheet (Uphold by-law for public trees) provides a perspective on how Forestry Services could be doing a better job to protect trees. In June 2014, TD Bank issued a 4-page report (TD bank UrbanForests torontoon the value of urban trees in the City of Toronto. What value did its bankers assign trees? $7 billion, with $80 million more in environmental benefits and cost savings each year. The report clearly states that large, healthy trees have the most value in urban spaces, and that their ability to sequester carbon and reduce stormwater runoff matters to cities. What is the value of Ottawa’s tree canopy? Forestry Services does not release, and may not be compiling data on, its extent or worth. This branch of the city keeps a low profile. To date, it has not provided Ottawans with data on these important markers. Even though Ottawa is a “green” city, Forestry Services seems unwilling to praise the virtues and value of trees that make up our urban forest. In the urban core, without strong protection provided under the two by-laws that provide tree protection, will we see diminished tree cover in the coming years? Since the Urban Tree Conservation By-law came into effect in 2009, Forestry Services has issued one report on its implementation. That was in November 2011, and it was dubbed a preliminary report. Isn’t it time for a full report on how the City’s tree protection measures are working? No built-in reporting schedule exists for Forestry Services, which is why citizens may need to lobby their elected representative for action. In Kitchissippi Ward, contact Jeff Leiper. The main problem is that a crack already exists in the pipe or foundation. Moisture is the likely reason for the crack. The solutions to this problem include not backfilling with clay, and ensuring that rainwater drains into soils. Reducing hard surfaces may help. Is this why trees along city trees have metal fences around them? More seriously, sometimes trees can be a threat to buildings or to people using a property. When a large, mature tree has its roots cut away during an excavation, such damage means the tree cannot support the weight of its trunk and crown. This is the main reason that a tree labelled as “dangerous would have to be destroyed. You get haircuts regularly. So should the tree that is gracing your yard. Learn more about how pruning and maintenance of mature trees can prevent them from becoming a hazard. Most forms of tree nuisance are not a hazard. They are just something that someone decides to dislike, to distraction. A towering maple that turned every flaming shade of orange and red in fall was cut down because new owners of the property did not want to rake its leaves. While it’s true that stuffing leaves into paper bags for pickup at the curb on garbage day can be onerous, raking leaves into a compost pile makes them much easier to deal with. Three neighbouring property owners mourned the loss of that maple. If you have fruit or nut trees that you think are messy, contact Hidden Harvest a crew of volunteers will come to gather your tree’s offerings.